The “public interest” provides the criterion of operation for the discretionary scope of many executive powers. This article explores to what extent this criterion acts as a constraint on power and its consistency with the rule of law. It identifies two key approaches in the High Court’s interpretation of such powers: an “idealist” approach, in which the decision-maker’s subjective, political assessment of the competing factors relevant to determining the public interest is not subject to judicial review; and a “realist” approach, in which the decision-maker’s assessment is judicially reviewable to ensure that relevant processes were followed and factors taken into account. In the migration sphere, the article traces the adoption of these approaches through three examples: the exercise of a national interest discretion to refuse or cancel visas; the introduction of a national interest test for the designation of regional processing countries; and the interpretation of the Minister’s public interest powers to grant visas to people otherwise ineligible. It is argued that the Court should adopt a stronger realist approach to reviewing public and national interest discretions through the adoption of a new meta-principle of interpretation. This principle would require that the exercise of public interest discretions is informed by a minimum content, to be determined by reference to the statutory context, ordinary rules of statutory interpretation, the wider non-statutory context in which the discretion is invoked and underlying values within Australia’s constitutional system. Variable intensity or standards of review is an issue that has long vexed many Commonwealth courts and commentators. 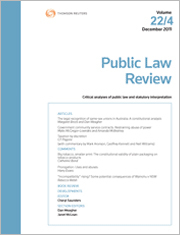 New Zealand is no exception, and a rigorous debate about the desirability of a structured approach to variable intensity of review has taken place in that jurisdiction for over a decade. Lacking in this debate, however, is any clear direction or guidance from the Supreme Court of New Zealand, which has remained silent on the issue. This article argues that this silence is a departure from the traditional approach of New Zealand’s highest courts being at the vanguard of administrative law developments, and that there was a missed opportunity to contribute to the debate when the High Court decision of Wolf v Minister of Immigration was released in 2004. The inaction from New Zealand’s highest courts in the years since risks the issue becoming mired in confusion. The expression “non-statutory executive power” has no single received meaning or application. It is a statement of conclusion, not a useful tool of legal analysis or description. Its use should not mask the inadequacies of arguments based on assertions about the “capacities” of the “Crown” or the essential differences between powers that are necessary to the functioning of the Executive and those that are “fitting” or convenient. Close attention to non-statutory executive power is essential as governments seek to do more and more without legislative intervention or authority. For the PDF version of the table of contents, click here: PLR Vol 28 No 4 Contents.